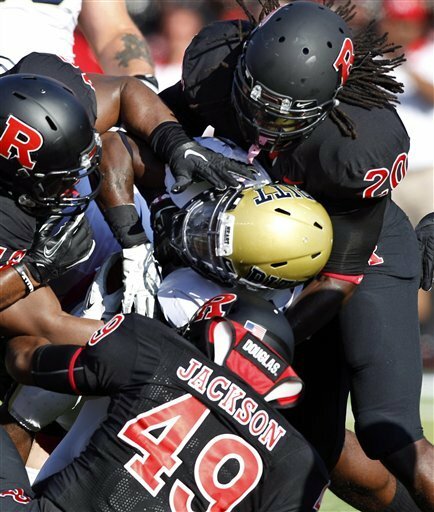 Over the past few seasons, Rutgers football started to cause a stir in the uniform world with some black alternate jerseys, but Tuesday, the Scarlet Knights took it to another level. 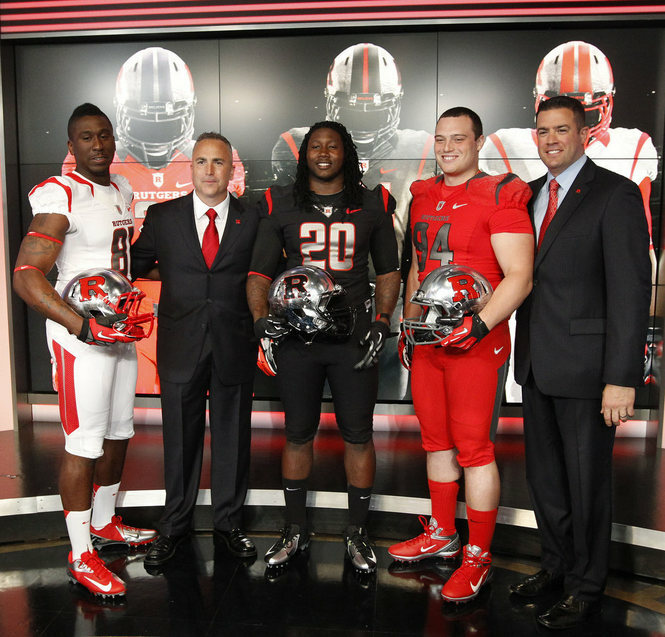 Rutgers showed off their new threads in a televised uniform reveal in the SNY studios in New York City, and they’re significantly different than anything they’ve worn before. Director of Athletics Tim Pernetti explained the uniforms as a move to look more like knights. 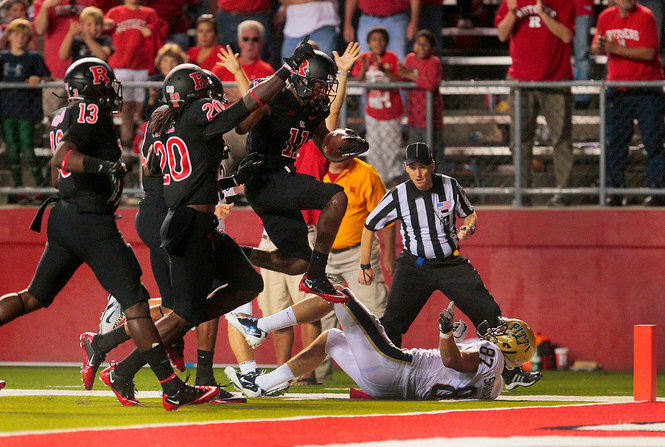 Without that explanation, you might think it looks like Rutgers is ready to jump in a spaceship and head to the moon. The silver helmets might give the opponents a hard time during day games because of the intense reflection of the sun. They’re supposed to look like the helmets of knights, and with that explanation, the helmets are not as offensive as first thought. The primary problem I have with the helmets is the thick stripes that go over the top of the helmet. They’re unnecessarily huge and have become the trademark of these new Nike college football uniforms. The uniforms themselves aren’t too bad. I like the all-white for road uniforms and all-red for the home garb. The numbers bother me a little bit just because silver numbers can become distracting while watching games. It should be interesting to watch these uniforms in action this fall. Here’s a full photo gallery of the uniforms courtesy of The Star-Ledger. As we lead up to the big-time bowl games, and I do not mean that as an insult to the Little Caesar’s Pizza Bowl, I will be going through my own lead up to the big game between Alabama and LSU on Jan. 9, and it all starts today. 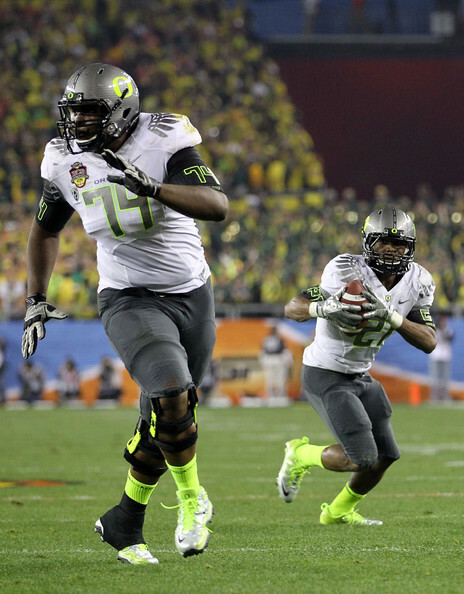 I will go over each BCS conference and rank the uniforms of the schools in the conference. From there, I will put together a nice bowl system to find your national champion of uniforms. We will start with the worst conference on the field, the Big East. I will get to the chase right away, the top team in uniforms in the Big East is … the Syracuse Orange. The Orange have undergone some changes in recent years since going away from the plain look of the 80s and 90s. Now, the white and blue stripes over the orange helmet and block S really makes the helmet stand out from the others. When we get down to the uniforms themselves, the combination of orange and blue, which is always a stellar combination, gives the Orange a stellar home and road look. The Panthers have a very simple, but effective look for both home and away uniforms. The combination of navy blue and gold on the helmets and the uniforms is clean. The high ranking of this look, also speaks to the mediocrity of the Big East when it comes to uniforms. The block lettering on the helmet is also quite impressive. The Mountaineers also have a classic look as well. However, in recent years, the yellow alternate with yellow pants have taken away from the usual home uniform. It’s really a shame because West Virginia looked very cool with the yellow pants and blue uniforms. The West Virginia logo is a good look as well. This season was a big step for the Bulls in the uniform department. They had employed an alternate white helmet to go apart from the usual gold helmet. The Bulls introduced a green helmet and green pants for their away uniforms, and it got off to a roaring start with a victory over Notre Dame. The logo is average at best. It’s hard to really tell what they are getting at. It’s clearly supposed to be a bull from a U, but I don’t think it really works. Here is where we get into the real dregs of the uniform world that is the Big East. 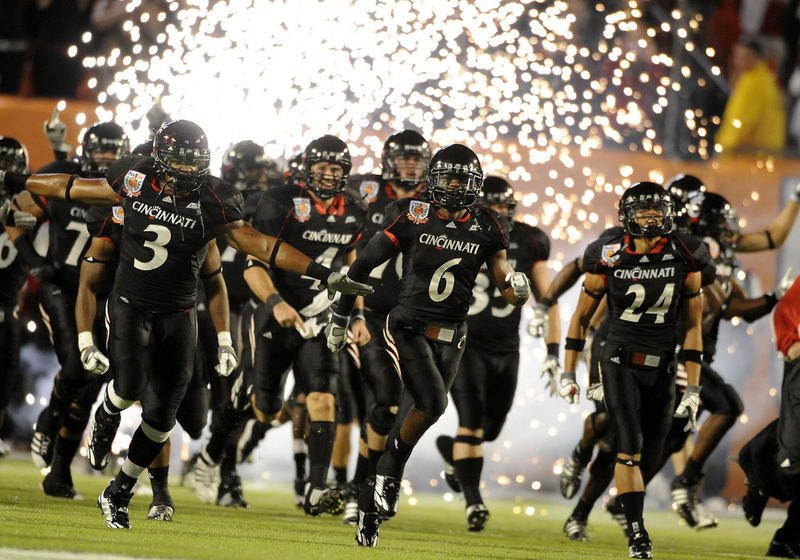 There’s not much about the Bearcats’ uniforms that will get anyone excited. The home uniforms are all back to go along with the black helmets, but the bear claws on the side take away from the simpleness of the uniforms. 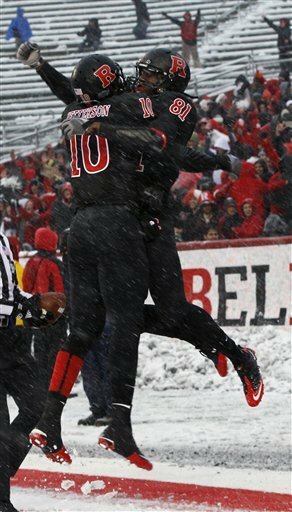 It's doubtful many of the members of the Rutgers football team will be celebrating their place in the Big East rankings. Again, the Scarlet Knights go with a simple look of red with white pants most of the time, but the all-black alternates from this season have taken away from the uniforms. There’s not much to say here, these uniforms are quite terrible. There’s nothing special to them, it’s like they’re stuck in the 80swith their uniforms. The Huskies have nothing special going on here. The basketball uniforms are so much better than the stupid football look. There is simply nothing to speak of here. The trimming along the sides doesn’t belong. So there it is, Syracuse will be moving on to the Orange Bowl of uniforms. They don’t rank among the best in the country, but just like in real football, the Big East doesn’t earn as much in terms of respect nationally. The offseason was filled with scandal in all of college football. From Ohio State to Miami to Oregon to even Boise State there were scandals and sanctions galore. One of the sanctions to Boise State that went unnoticed was the Mountain West immediately putting some restrictions on their newest member by telling Boise it could no longer wear its blue jerseys for conference home games. 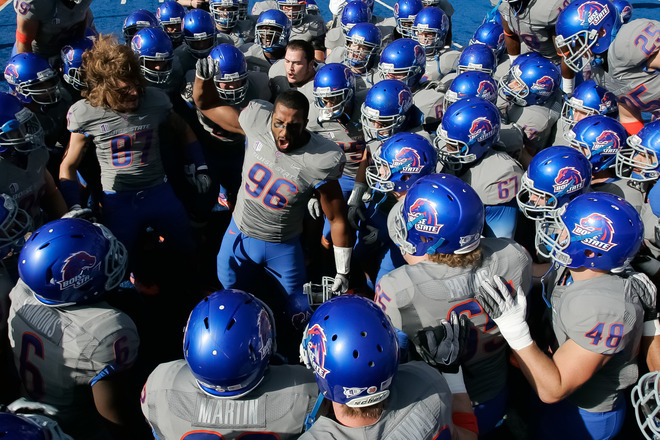 The trademark blue turf in Boise, Idaho, made for a camouflage look for the Broncos. Boise finally ran into this problem on Saturday when they hosted Air Force. Boise has been changing their uniforms a bit over the past few seasons as it has become a consistent national title contender. They’ve gone with all-white at the start of the season against Georgia and used a new helmet for their bowl game against Utah last season. 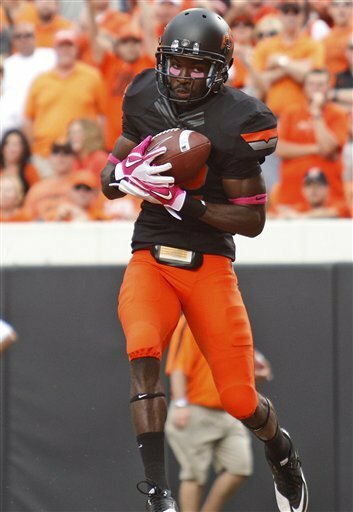 Yesterday’s look was similar to what they wore to defeat Virginia Tech in the season opener last year. The only difference is the helmet Boise wore yesterday is similar to the helmet they usually go with. 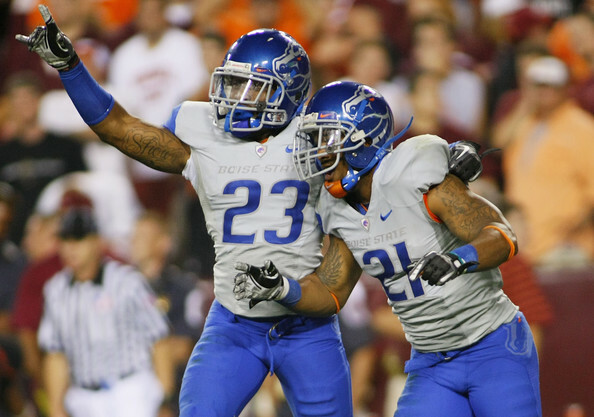 Personally, I was hoping Boise would decide to go with its orange look it employed for a game last season. It would certainly accomplish what the Mountain West was looking for in that they would stand out from the blue field. At the very least, this adds a bit more intrigue to the uniform selection for the Broncos every week. They might be falling a bit in the BCS standings, but the uniforms should keep us on our toes. 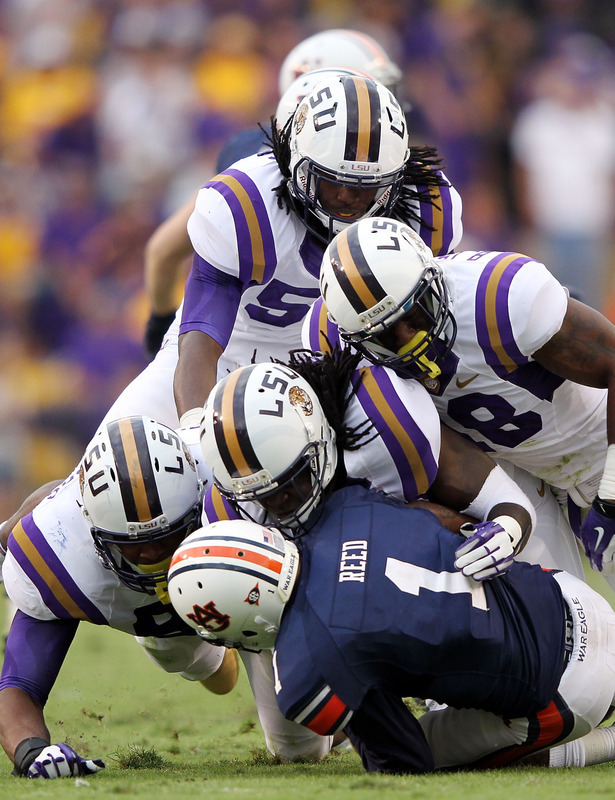 Top-ranked LSU turned some heads with its uniform selection in a blowout of defending champs Auburn. The white helmets and white pants are the primary departures from the normal yellow here. There is also gold weaved into the stripes on the shoulders and the helmets. Overall, the look is fine, nothing too jarring and not that far from the norm. 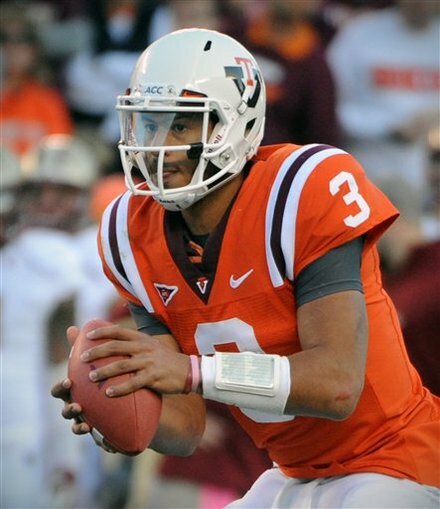 Virginia Tech went with an orange throwback look against Boston College. The Hokies have started to mix in some surprises in the uniform department recently. For the most part, they work. 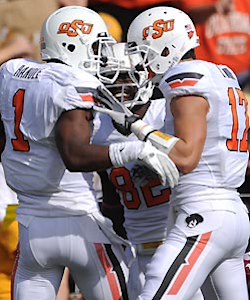 Both Oregon and Oklahoma State went with all-white in road victories yesterday. Sometimes it’s nice to see a simple look from these teams. 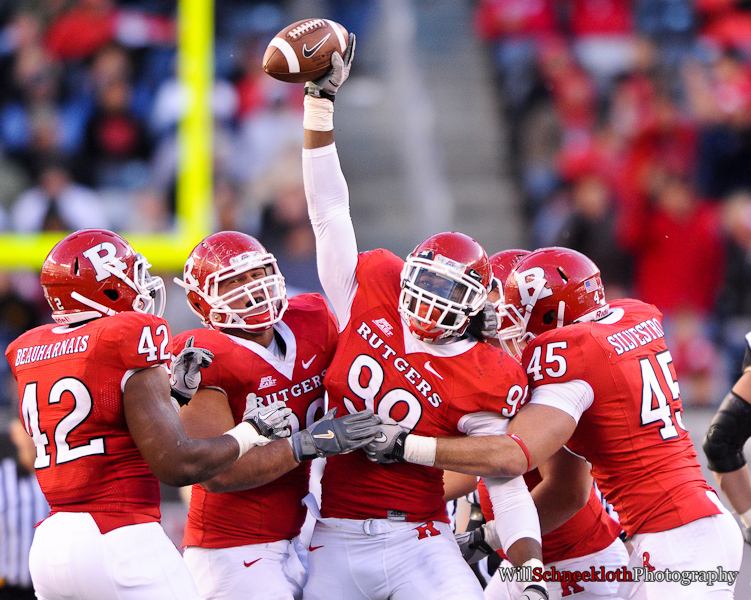 Rutgers went away from being Scarlet again on Friday night. 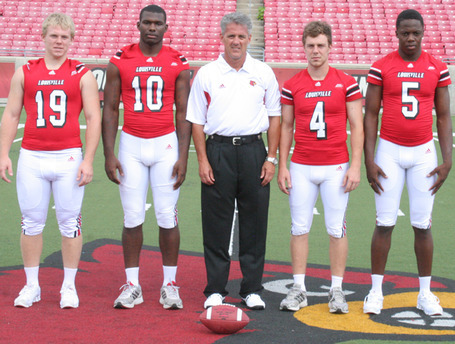 They chose black helmets, white jerseys and black pants in a loss to Louisville. The only difference between this and the look they wore at home against Pitt was a white R on the helmet instead of the red seen against Pitt. Maybe Rutgers didn’t feel as fierce with the white R and that’s why they lost.